Toolrest handle for the Saturn lathe. 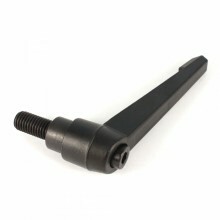 A ratchet handle suitable for previous models of DVR XP, DVR 3000 and Nova 3000 lathes. Ratchet mechanism allow you to position the handle out of the way to minimise interference with your chisel. Click the button below to add the TOOLREST UPGRADE HANDLE FOR SATURN LATHE to your wish list.